to lose most of the hair on your forearms and your head (wear a hat) this is because twisters are so close to the body unlike poi and twirling which are twirled further away from the body. When using fire twisters, the place you are going to burn most is around your forearms and especially your hands most of the burns do not really come from the flames but from the heat from generated as twisters become very hot in certain places and most of the burns are caused by catching or holding the them in the wrong place (mistakes) when these do happen the burn blisters can range from the size of a pea to an egg and believe me they Burn for days and if the blister bursts and rips open, you can forget about using that hand for up to at least 4/6 weeks. I have had some burns and it has taken about two years for the scarring to disappear these were mainly caused when I started using fire twisters and experimenting with different measurements, do not get me wrong I still burn myself but nowhere as bad. Even though these were caused by the heat generated by the flame. The flame its self is still very dangerous to you especially around the Eyes, burning cataracts causing blindness, or nose and mouth, breathing in the flames and burning your lungs which could be Fatal. If this has not put you of yet, check out the information in the other relevant pages below.  Remember though Glowstick Twisters are a safer alternative and you can achieved a lot more moves with Glowstick's rather than fire. These are some of the reasons why Twisters are not used like Nunchaku. If you held these like Nunchaku you would burn yourself very fast. Think of these as a form of visual art that you can dance with. Unlike Nunchaku which most people use as an Offensive \ Defensive weapon. 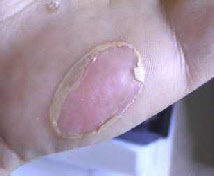 A sample of a Heat burn blister caused through skin contact of an extremely hot object and not caused by a naked flame. It took six days for this burn blister to go down. it was about to nit back on to the hand when the skin broke, because it took so long the skin under the burn had stopped weeping so there was less chance of an infection. 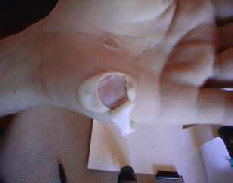 The blister was then left and kept dry for another two days to let the air harden the underlying skin. Then the hand was put in warm water for 15 minutes this loosens and lifts the damaged skin. Then the loose damaged skin was carefully cut away, with at least 5 mm of damaged skin around the edge left, this is important as it is still connected to living skin, the damaged skin will dry up in about 3 days then the skin can gently be removed. When initially removing the damaged skin the new skin underneath will be very red and tender to touch but shouldn't be to sore this will disappear as the new skin hardens. If at any time clear liquid starts weeping from the burn you need to put some antiseptic cream on it as it hasn't quite healed yet. The photos above were taken over a period of 12 days, after 10 days i could use the hand without any discomfort. If the skin had broken with-in the first couple of days it would of taken at least 3 weeks, before I could use the hand as it would of had to scab over first which causes more problems as if you tried to use the hand there is a good chance the scab would break which not only causes some discomfort you have to wait until it heals its self again.